Nitrogen deficiency in strawberry plants can cause rather significant problems for the longevity and vitality of strawberry patch. If your soil is low in nitrogen, you can expect consequences. This post will cover the basics of what to look for to determine whether or not your strawberries lack sufficient nitrogen-containing soil for optimal health and vigor. What Indicates Nitrogen Deficiency in Strawberries? In order to confirm nitrogen deficiency in strawberry plants, one ultimately must take a few tissue samples from affected leaflets that are “middle aged.” The leaflets that must be sampled cannot be the old ones toward the bottom of the plant or the new, bright green ones emerging from the crown. Once samples are collected, they must be tested for average composition. The baseline measurement for nitrogen sufficiency is 2.6% to 2.8%. Should the measured percent composition of nitrogen be below 2.6% for the tested sample, it is very likely that the soil is nitrogen deficient, resulting in less-than-acceptable levels of nitrogen in the foliage tissue of the strawberry plants. The old agricultural rule of thumb is that strawberry plants with yellow leaves indicate nitrogen deficient soil. However, while purple leaves often indicate a phosphorus deficiency, nitrogen deficiency can also cause purple leaves in addition to strawberries’ yellow leaves. 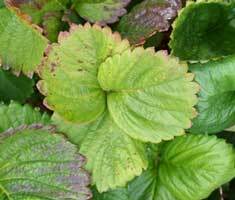 Yellow Strawberry Plant Leaves – Why? A nitrogen deficiency is manifest (and consequently visualized more easily) in the middle-aged leaves. The yellow strawberry plant leaves occur in these middle-aged leaves, primarily, and not the new, still-green leaves emerging from the crown. This is due to two factors. First, nitrogen is a component in many amino acids. In plants that lack this vital nutrient, proper amino acid synthesis is unable to be completed. The lack of amino acids yield the discolorations. Additionally, purple strawberry leaves can also be attributed to nitrogen deficiency (instead of the more common phosphorus deficiency causing the purple leaves) when carbohydrates build up in the plant tissues due to problems with amino acid deficiency. Second, the young leaves emerging from the crown exacerbate the deficient state of the middle-aged leaves by appropriating for themselves the nitrogen that otherwise would have been used in the older leaves. Due to the demand of metabolism and synthesis of the newly emerging foliage, nitrogen will be mobilized from the middle-aged leaves to the new ones. This leads to more severe color changes in those leaves, depending on the overall severity of the nitrogen shortage. If your strawberry plants have yellow leaves, the chances are good that they also have nitrogen deficiency. While not the only cause of yellow leaves (multiple other diseases can cause yellow or yellow-spotted leaves), it is surely a good idea to determine if your soil is lacking this crucial component. With the multitude of organic nitrogen fertilizers available today, the problem should be fairly easy to remedy. Just be sure to check the Growing Strawberries page to make sure everything is done correctly! 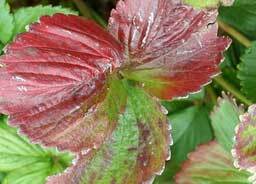 And, to learn about other damaging strawberry diseases and strawberry pests, see the Strawberry Plant page. Are you able to identify the cause of yellow old leaves with brown edges? New leaves are perfect, old ones look like deciduous tree leaves in autumn, with the brown scorched edge look. So what do you add to the soil for nitrogen? My potted strawberry plant has many little runners. Now it has many yellow leaves. Are potted strawberries more at risk from having nitrogen deficiency? Potted plants are typically more at risk for most problems associated with strawberries due to the limited space, difficulty in maintaining appropriate moisture levels, and overcrowding. You could have your soil tested to see if they are truly lacking nitrogen or to identify another potential problem. Good luck! How much water is too much? How often and how much water should the plants be getting? My strawberry plants have been in the ground here for about 4 years now and at first they looked better this year then they ever have! They were a little taller, healthier looking and getting quite a bit of flowers. But all of a sudden this morning I noticed the bottom leaves getting bright yellow. Now I am not sure if it has to do with the weather or not because NJ has been a little crazy since the start of winter, spring took longer to get here too. I have not watered them at all this year as they didn’t seem to need it once they started to grow. I put mulch on them last year and we had a lot of snow this year too (and snow that lasted for quite some time on the ground too not melting right away.) Then we had enough rain over the last week that the soil still appears damp. Do you think that the mulch from last year could have taken some of the nitrogen out? Last year we had a high amount (too much for the tomatoes anyway) but I kept the old mulch on the soil. Or do you think that it could be the rain and the soil being constantly wet? The plants look great other then the yellow leaves starting on the bottom. My Impatients have some yellow leaves too, but they are in a new spot of the yard (way away from the strawberries) and were just planted so I thought maybe they just needed to adjust. It is quite possible that the strawberries are overwatered. Overwatering can cause yellowing of the leave, support fungal growth, and can contribute to wilting as well. Strawberries are quite adaptable, but too much or too little water can wreak havoc with them. Good luck! I’m surpised it doesn’t mention perhaps the most common reason: overwatering can cause yellow leafs in my experience. That topic is covered on the Growing Strawberries reference page. Good luck!